As the Holidays approach, you’re probably starting to freak out a bit. 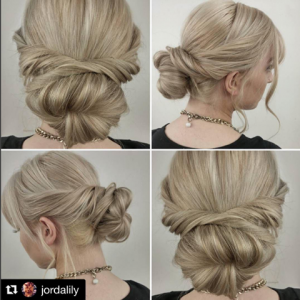 From deciding which sparkly outfit to wear to getting a kick start on shopping for presents, the last thing on your mind is what hairstyle to rock at your next party. 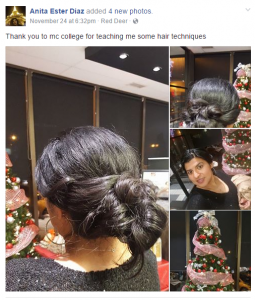 On November 28, our Edmonton, Red Deer, Calgary, Winnipeg and Saskatoon campus held a FREE DIY (aka: do it yourself) studio hair event for the Holidays which was open to anyone and everyone to attend! Whether you’re headed to an ugly Christmas Sweater party or Christmas Carol Karaoke and everything in between, our students and staff showed you how to create snap worthy Holiday hair looks on yourself so that you can avoid the dreaded “Pinterest fail” feeling! Each campus had different stations dedicated to specific hair looks; from chignons to old Hollywood finger waves, Victoria Secret inspired curls and braids. At our Winnipeg campus, our Students glammed up each attendee with a free lipstick touch up at their Lipstick Lounge. Swag bags, giveaways and a $1000 tuition scholarship were handed out at each campus. Missed our DIY Studio: Holiday Hair event? Stay tuned for our next event! What’s the MC College DIY Studio event? It’s a series of do-it-yourself tutorials where we show you how to curl and style your own hair, create a creepy doll eyed look for Halloween and more!